Rocket on arrival at World Horse Welfare’s Glenda Spooner Farm. 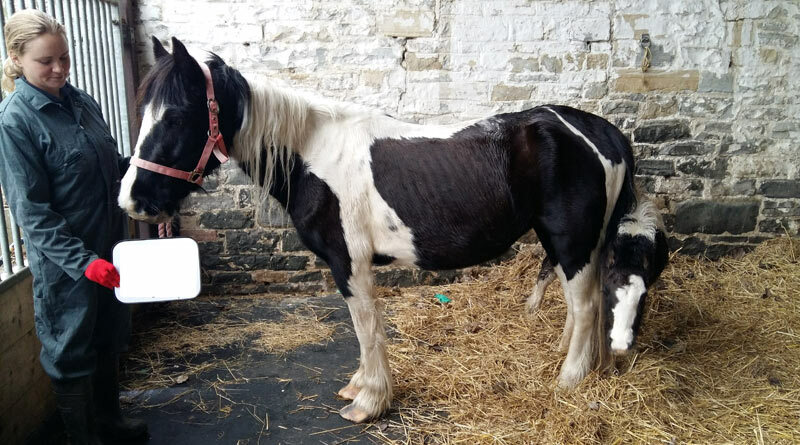 An emaciated mare suffering from liver damage, possibly from ragwort poisoning, has made a miraculous recovery after more than a year of care. Dolly and Rocket settle in at Glenda Spooner Farm. Dolly was found by a World Horse Welfare Field Officer in Dorset in March 2017. She was emaciated, weak and struggling to survive whilst still taking care of her very young foal, Rocket. Her body condition score was recorded as 1 out of 5, and it was clear she needed urgent veterinary attention. Her owner signed her over into World Horse Welfare’s care and she was taken to the charity’s Glenda Spooner Farm Rescue and Rehoming Centre in Somerset. Farm Supervisor Grace Vooght said that when Dolly first arrived she was very thin with all of her ribs and vertebrae clearly visible. Routine blood tests showed she was suffering from severe liver damage. “One of the most common causes of liver damage that we see is ragwort poisoning but without knowing her background, it was difficult to determine what had caused Dolly to be in such a terrible condition,” Vooght said. Weaning Rocket did not help improve Dolly’s condition, and her liver was slow to repair. “It was very much touch and go as to whether she would survive,” Vooght said. Dolly and Rocket on arrival at World Horse Welfare’s Glenda Spooner Farm. Both ponies are now living out in their herds and have undertaken their handling training as well as learning to go into a trailer, in preparation for them to find new homes on the charity’s rehoming scheme. “Dolly’s recovery really is miraculous and I can’t wait to see both her and Rocket settled into happy new homes,” Vooght said. Dolly has made a miraculous recovery. World Horse Welfare Chief Field Officer Claire Gordon is urging owners to remove ragwort from their fields. If eaten, it can cause irreparable liver damage to horses. World Horse Welfare has produced a leaflet on ragwort, which can be downloaded here. “Spraying [in Spring] while the plant is growing is the most effective way to eradicate it from your pasture, but you must be able to rest the field after spraying. For those without access to additional grazing, pulling the whole plant up – including the roots – is the next best option,” Gordon said. Signs of ragwort poisoning in horses include rapid weight loss and a lack of energy, stomach pain, and a loss of co-ordination. They can develop photosensitisation, where areas of pink skin become inflamed and painful when exposed to sunlight, like serious sunburn. • Both Dolly and Rocket are available for rehoming. View Dolly’s profile here, and Rocket’s profile here. Rocket has thrived in the care of World Horse Welfare, and is now ready to be rehomed.